Agra is enclosed by the beautiful monuments and structures. The city is boasting with maximum numbers of UNESCO declared world heritage sites that makes the place holds a prominent place in India tourism. Thousands and lakhs of tourists from across the world travelled to Agra often and enjoy the rich and glorious heritage of the city. 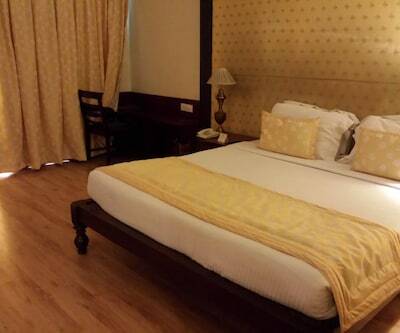 For travellers there are numerous of 4 star hotels in Agra which offers exotic services and brilliant amenities. Tourist during their vacations can stay at the retreat which is one of the best 4 Star Hotels in Agra which includes 33 Deluxe Rooms, 20 Premium room, 1 Suite and 2 Banquet Space along with a signature restaurant and a Bar. 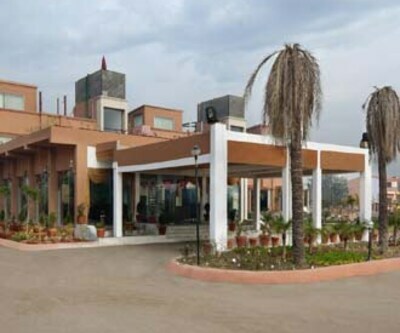 The hotel is located 12 km from Kheria Airport and 6 km from Agra Cantt and 5 km from Bijli Ghar Bus Stand from where you conveniently reach the hotel. The rooms of the hotel features touch of elegance and are filled with all modern amenities such as direct dial telephone, LCD, High speed Wi-Fi aces, Tea and coffee maker, mini-fridge and many more. The attached bathrooms are filled with all essential amenities and necessary toiletries. The in-house restaurant spreads its delicious aroma which is sufficient enough to tickle the taste buds of the patrons. The hotel also features, Swimming pool, Business centre, conference hall ( spacious and well-fitted), railway station transfer, central heating, airport transfer guide service, doctor-on call, handicap facility, laundry service golf course, board room, travel desk and many more. Famous tourist attractions of Agra near hotel are Taj Mahal (2km), Agra Fort (5km), Jama Masjid (6km), Itmad-Ud-Daula (8km) and many more. 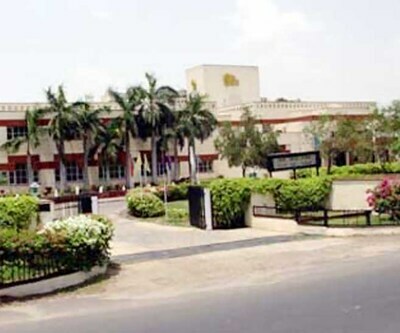 The Grand Imperial is also listed among 4 Star Agra hotels which offer a 30 well- decorated rooms and a spacious conference hall and a large banquet hall with 500 seating capacity. In addition to this hotel also houses a swimming pool, spa and a functional travel desk. Major modes of transportation near hotel are Idgah Bus Stand (2km), Agra Cantt Railway Station (4km) and Kheria Airport (10 km). The guests in the hotel and tantalize their mouth with scrumptious delicacies such as Chinese and Continental. 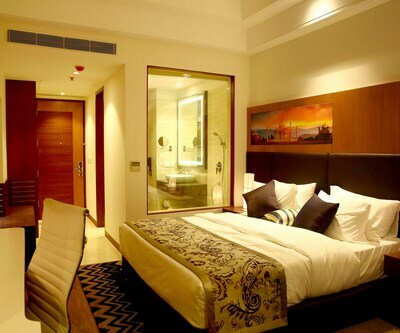 Continuing the list four star accommodation places in Agra, Four Points by Sheraton is also a decent property. It includes a Roof Top Restaurant which overlooks the iconic Taj Mahal, Oasis which includes several cuisines and Henry's which includes alcoholic and non- alcoholic drinks. Jama Masjid, Agra Fort and Taj Mahal are located within the radius of 5 km from hotel. hotel atulyaa taj, The Retreat, The Grand Imperial, The Taj Villas, Howard Plaza, The Fern Agra, The Grand Imperial, Four Points by Sheraton and Rudra Vilas are some of the really good 4 Star Hotels in Agra. Agra is encircled by many Luxury Hotels. The city which was once the capital of India during Mughal era has 3 UNESCO World heritage site which are Taj Mahal, Agra Fort and Fatehpur Sikri nearby. How far Double tree by hilton agra from Taj mahal.? Its around 3 km From Taj mahal. Tell me about hotel the retreat agra.? The Retreat Hotel Agra is located in 01 Km from the magnificent TajMahal, one of the Seven Wonders of the World. The city is just a few hours� drive from Delhi. Part of India's rich history since 1000 B.C Retreat hotel offers a calm and peaceful oasis for business and leisure travelers. Its strategic location offers a walkable distance to TajMahal. 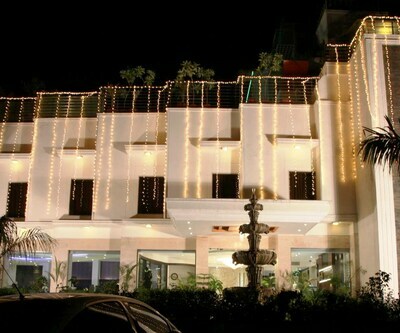 The hotel is easily accessible to guests, being close to the city�s airport and railway station and the Monuments in Agra. Is the use of swimming pool chargeable or complimentary in Howard Plaza The Fern Agra?